One of the first things that people notice when they come to Thailand is the wiring running down the street. It’s a rats nest. Literally. It’s simply amazing to look at. It’s not uncommon for the wires to hang so close to the ground that you have to duck your head when walking under them. High-voltage wires are completely intermixed with telephone wires and fiber optics. 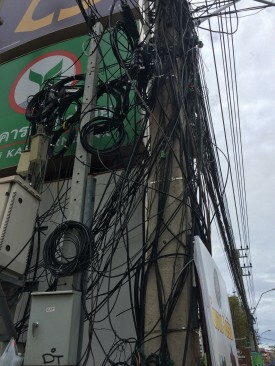 The reason for this indescribable mess is the way the telephone wires are installed in Thailand: the telephone company “points of presence” are located on select telephone poles. It is the responsibility of each house to run their own wire from their house back down the polls to this point of presence. 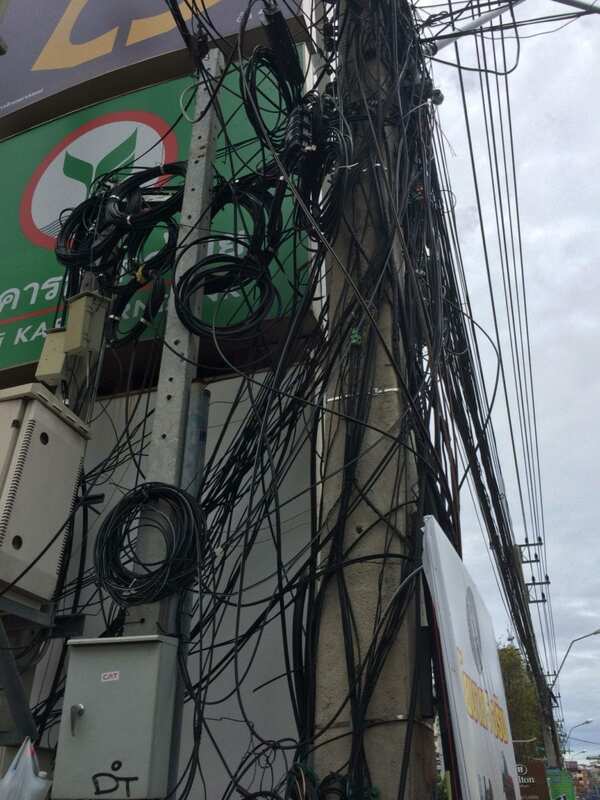 You hire an electrician, or your neighbor, or perhaps your neighbors seven-year-old son to run these wires. You never take them down. If something goes wrong you just add another wire. And another. And another. After a while you get something that looks like these pictures. Now when I say that you may be higher your neighbors seven-year-old son to run the wires I’m completely serious about that. It’s not uncommon to see a little boy up on a bamboo ladder splicing fiber optic tables. They’re really quite good at it. I won’t editorialize that this is work so simple to do young boy can do it, but it is so simple that young boy can do it. You would think that a mess like this would be completely dysfunctional. It’s ugly, but it works. There is fiber optics running to most buildings. 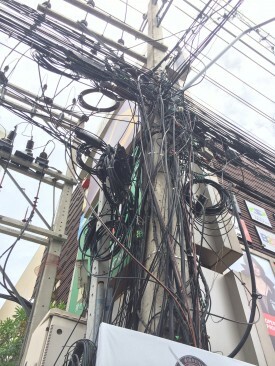 You have more likelihood of having fiber optics available to your business in Thailand than you do in many American cities. I find it fascinating that such a system can work. Often times the wiring inside of an office building looks no better. Yet, somehow, it all seems to work just fine. I’m not sure what the big point is here other than I know in America we obsess too much about recordkeeping and things like that. 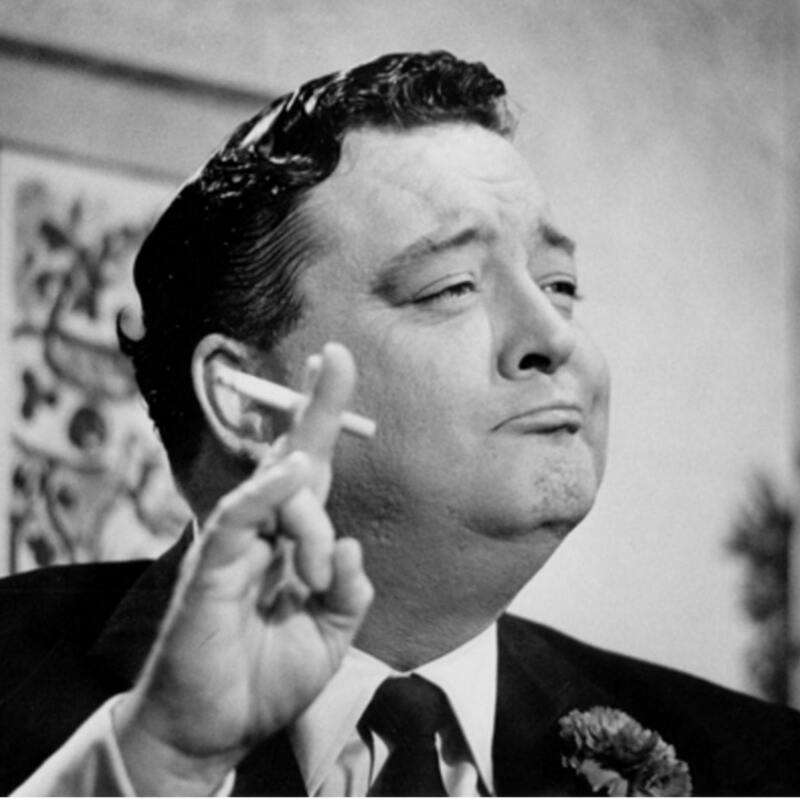 Maybe it’s time to just let loose and make some forward progress rather than killing every project with excessive overplanning. Maybe we can learn something from the Thai: don’t overthink things. Just do it. Take action. People really don’t seem to be hanging themselves on wires for electrocuting themselves.